Today I had to make similar changes to 10 Windows servers. The changes consisted of copying a couple specialized programs from a source location and updating the Windows path. I couldn't remember how to update the Windows path variable from the command prompt (other than for the current command prompt of course) so I tooled around the Internet a bit until I found it. But as I was looking for the solution I found a lot of confusing and incomplete information about the Windows path variable. Most of the info I found consisted of brief posts often followed by several discussions asking for more information. Not knocking anyone here but most of this appeared to be by developers and not system admin types. So I wanted to provide a thorough discussion on the Windows path variable, what is is, how it works and how to use it. The Windows path variable has its roots way back in MSDOS, which means it's been around for over 30 years. Basically the path is a list of directories (or folders) to be searched when a command runs. For example say you're at the root of the C: drive in a Windows command prompt. If you execute a command like robocopy Windows will look in the current directory first for the executable, robocopy.exe. Since robocopy.exe isn't in the root of C: by default, and if you didn't have a path variable defined with the correct path you would get the message, "'robocopy' is not recognized as an internal or external command, operable program or batch file." But since Windows by default has at least "C:\Windows\system32;C:\Windows" (usually more) in the Windows path the first directory, C:\Windows\system32, will be searched for robocopy.exe, and since it's there the program will run. If it weren't there then the next directory in the path C:\Windows would be searched, then the next and so on until the program is either found or not. The Windows path will always be searched whenever a command is executed (that isn't a core command like dir, or when the executable isn't found in the current directory) either from within a command prompt or Windows itself. Remember it's always possible to specify the path and executable like with C:\Windows\system32\robocopy. This will launch the command or program directly without having to search the path. One of the quickest and easiest ways to view your current path is to open an command prompt and enter the command, path. It's worth noting that often when a program is installed the path to your application may be added to your path. Your path will often consist of a dozen or more entries (in fact, I stripped down my path for the previous screen shot to show only a minimal path). Back in the days of DOS and even Windows 95/98 and Windows NT the path was set through either (or usually both) files called comspec.sys and autoexec.bat. In order to make a permanent change to your path it was common to edit either or both of these files. But since these operating systems are so old and probably not used by many we'll skip the details. So starting with Windows 2000 and XP (right up to and including Windows 2003, Windows 2008, Windows Vista and Windows 7, and I'm sure Windows 8) Microsoft did away with config.sys and autoexec.bat and moved the path variable (and others) into the Windows registry. Of course you could edit the path directly in the registry but that's usually not a good idea and since there are other ways that's what we'll look at. First, it's important to understand that there are different path variables; system, user, and what I like to call context (or session) variables. For example when you open a command prompt the system and user path variables are read from the registry and assigned to that command prompt. If you use the path command to modify the path it will only be modified within that command prompt session, or the "current context." Let's say you are using a program while in a command prompt and want to add the path to that program to your path just for the current session. You would simply enter the command set %path%;<path to new program>. This would take your current path (as specified with %path%) and add or append the new path. NOTE: use a semi-colon (;) between path entries. For this example I added the path to a useful Amazon S3 utility called S3.exe. Now I can run S3.exe without having to specify the full path to the command. However, when I close the command prompt and open a new one this entry will not be present. I'd have to add it again. Or, add it to the Windows registry. 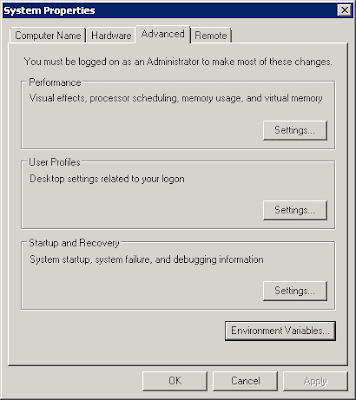 Settings for both user and system path variables (and a lot of others) are accessed through the System Properties applet. Here are two ways to access System Properties. Right-click on Computer (formerly My Computer), click Properties. Within the System window click Advanced System Settings. This will open the System Properties window. OR, click Start, Settings, Control Panel, System, Advanced System Settings. This will also open the System Properties window. 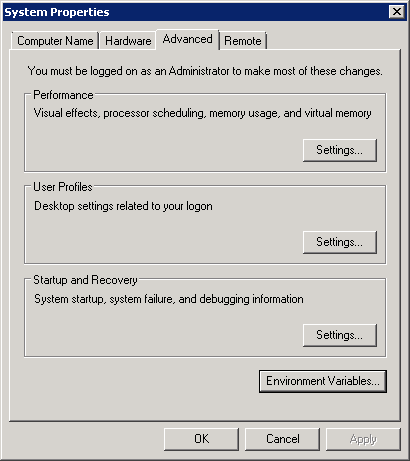 Click Environment Variables in the lower-right. This will (finally) open the Environment Variables dialogue window. 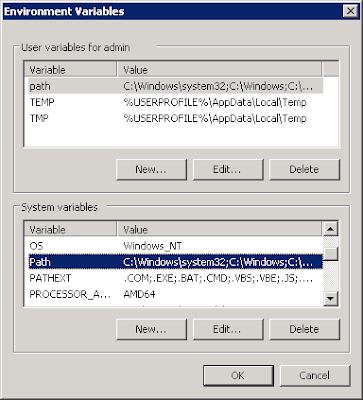 The Environment Variables window allows you to add/edit entries to both the current user's path and the system path. Entries in the system variables path will apply to all users on the system, whereas the user variables will apply only to the currently logged on user - i.e. you. Just like with about everything else there's another way to do this and that's with the setx command from a command prompt (my preferred method.) Using setx you can make permanent changes to either the user path variable or system path variable (or both). NOTE: use quotes where shown in the commands. The /M switch is used to set system path variable. Both commands are written to the system registry as with the previous examples. Example (user path variable): setx path "%path%;C:\Admin\Utils\S3exe"
NOTE: these commands do NOT update your current path (in the command prompt), so you'll have to open a new command prompt for the path variables to include new/updated entries. In the beginning I mentioned I had to make similar changes to several servers. I was able to use robocopy to copy the programs/files I needed and setx to update the system path variable. My commands consisted of about 5 lines that I just copied and pasted into the command prompt on each server and my "deployment" was completed in minutes using these simple commands.